Would you know the Brazilian (provisional) registration for the 2nd aircraft that will be delivered to Wideroe? Nean, it is often not possible to locate records for them on the FR24 because Embraer in flight tests generally does not use the aircraft prefix but rather a random record (example: "PROVA", "TESTE", 19020010, etc ...). PU-AAA to PU-ZZZ: http://www.aeromuseu.com.br/rab_pu.htm (ultralight and experimental only). I'm optimistic on the E2, C-series, MRJ, MC-21 and a little on the SSJ (it is now out of date with E2 EIS). I'm pessimistic on the ARJ-21, C919 (not because of the engines, but the interface definition is poor, which Embraer went from poor on the E-190 to possibly best in the world). e.g.g, the Global 7000 will rule the business jet market. There's 280 orders on Embraer's books for the E2, however 100 are for the 175E2 which may never see the light of day, and the 50 Air Costa orders don't mean anything from an airline that hasn't been around for over a year. So now you've really only got 130 orders for the type, only 35 of which are from an airline at all (perhaps 45 if the undisclosed ones are from an airline) the rest are from leasing companies. While I'm not in airline leasing I would assume this balance isn't one that leasing companies feel too great about. If you don't have an anchor or a couple anchor customers throughout the world it makes it harder I would assume to justify having the frame in your portfolio when besides for a few customers the pool of places to lease your plane just isn't very deep. I'd love to hear what sort of balance and or what lessors look for in a frame, but my hunch is that Aircastle, Aercap and ICBC would feel a lot better about their 85 frames if there were more than 45 frames on order from actual airlines. 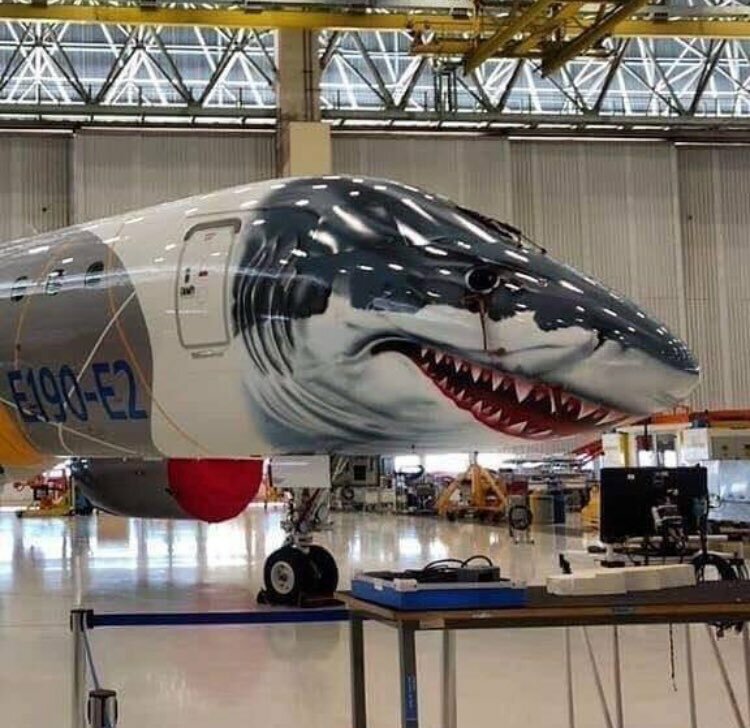 I think Embraer will pull it off, and I think this is the year where the sales will follow the insanely well executed (on time on budget who even does that any more? ) but I don't think we can get around the fact that this year maybe make or break for the frame. By the end of the year if they don't really add to the backlog they are looking at less than two years of backlog for both the E1's and E2's combined, and that's not a great place to be, especially when you're trying to transition and the only plane you've been selling lately in droves is one whose' replacement you might not even build. Again I think this will be an exciting year for Embraer full of orders and exciting new opportunities, but part of that is it has to be, otherwise things could get rough quickly. I agree the MRJ has a hill to climb as well as the E2-175. Right now there are only 128 viable orders. Leasing companies will be competing with Embraer for new customers. This year could make the E2. It is too early to break it. But we have a launch customer who should only buy via lease who received a good enough deal to buy direct. However, I was serious that the cost effectiveness of the E2 might let the launch customer profitably expand the niche. There should be sales. B6, NK, and UA are shopping. Any one is enough. I expect sales by Farnborough. I also expect C-series sales too. Pratt really needs the combustor upgrade proven. I agree the MRJ has a hill to climb as well as the E2-175. Right now there are only 128 viable orders. I believe there is a good market to be explored in China and according to the new rules stipulated by the local government. "Embraer sees E175 in sweet spot for China's regional push"
"China’s requirement for startup operators to fly regional aircraft before stepping up to larger jets is expected to drive sales of the Embraer E175-E1, says the airframer’s commercial head." "Embraer has had success with the larger E190s and E195s, with 106 of the jets in service in China. That is expected to give the airframer a springboard for further sales of the re-winged and re-engined E2 series, which should also see some benefit from carriers looking to expand their networks in the west of the country." "EMBSPBR"]The "Pioneer Airlines Flights" episodes. "Pioneer Airlines" is an in-house Embraer operation that simulates actual airline operations, flying with typical airline utilization and turn times to ensure the reliability of the aircraft prior to EIS. More than 600 dedicated maturity flight tests were conducted after the aircraft was certified to ensure that the systems delivered to customers were performing at mature levels." Iron Maiden rockstar, pilot and aviation enthusiast, Bruce Dickinson, stopped by our HQ over the weekend for a demo flight in the Embraer Legacy500. It was an honor to have him visit! Second E-190-E2 to Wideroe delivered today in its base at Bergen Airport, a journey that started yesterday on route via SJK-REC-LPA-BGO. Congratulations to all involved at Embraer em Wideroe !!! Internal records at EMB confirm 100% dispatchability during these first three weeks of commercial operation. Were there any aircraft swaps to maintain the zero cancellations? No! There is only one E2 in service so no swaps. A true 100% dispatch reliability. Didn't mean to upset you so much as to bang your head against a wall. Was it that upsetting? You do realize they can not cancel a flight and swap to other aircraft, right? They can easily down-gauge to a Dash 8 and not cancel while taking the E2 out of service. Put some ice on your head. Thanks for the clarification. See, no head banging needed. Embraer confirmed 100% dispatch reliability and if something would happen and swapped so a Dash 8 the E2 would not have 100% dispatch reliability even if flight still on time. Therefore as 100% no aircraft swaps. The first aircraft (LN-WEA) was regularly flying 8 flights a day, always on domestic trips centered in Bergen. Since May 15th the circuit has been changed with only 4 trips a day, with the start of international flights to Helsinki. A dispatchability of 100% is an interesting indicator and define how reliable a product is. In order to have a better idea of the performance of the airplane it would be necessary to have the operational factor statistics, which would show the proportion of time that the aircraft is available for commercial flights. So far the results look good but to E2 generation such performances should be compared with aircraft as good as the B737 and the A320. It will not be easy. Only 4 days after being received by Wideroe, the second aircraft 190E2 (LN-WEB) started commercial flights today, performing the Berger-Bodo route. Do you know when they have to decide on the other options? I'd think we might see some conversion pretty soonish. When that first production begins E195-E2 and E175-E2? E195-E2 first quarter of 2019. EMBSPBR you You are from Brazil? Glad to know that all the efforts made by Embraer and resulting from the operation of more than 1,400 E-Jets worldwide, which ensured an EIS without any major embarrassment to its first operator, Wideroe, and should stay with its new customers to this magnificent aircraft. With two E190-E2s in operation, Wideroe has maintained 100% regularity on all flights. Its third aircraft will be in operation during the second half of June. The good numbers are driving new sales campaigns. A little-known airline has been producing impressive results for nearly two years. But it has no network, its airplanes have no fancy livery and you can’t buy a ticket on it. "It’s an international airline that carries no passengers or cargo. It flies no scheduled routes, earns no revenue and doesn’t participate in any frequent flyer program. Yet Pioneer Airlines employs over one hundred engineers, pilots, technicians and administrative personnel that support a fleet of Embraer E-Jets E2s from São José dos Campos and Gavião Peixoto, in the state of São Paulo. Embraer set up Pioneer Airlines to ensure there were no teething problems with its new-generation E-Jets, the first of which was delivered to Widerøe Airlines of Norway last month. Three prototype E2s were dedicated to flying a rigorous airline schedule to identify potential problem areas so they could be corrected early in the development of the new aircraft program. Embraer learned a lot from reviewing performance data from some two million flight hours accumulated on a worldwide fleet of 1,300 first-generation E-Jets. That information, and direct customer feedback, helped engineers design a more efficient and cost-effective aircraft – the E2. But the company went one step further by operating a mock airline in its quest to deliver a fully-mature airplane at service entry. “We studied the product’s history by looking at all the flight hours, identifying what were the problems, and developed specific tests to run on the new aircraft. “Pioneer was conceived to duplicate real customer operations inside Embraer, with a test campaign that follows the same day-to-day rhythm as a functioning airline", says Marcelo Tocci, of Embraer’s E-Jets E2 Program Management division." At each stop, the aircraft was subject to normal airline ground handling activities and turnaround procedures. The support team measured servicing time, evaluated systems performance against expected standards, recorded any deficiencies and irregularities and fed all the information back to the engineering group for follow up. Good news, most probably. Good surprises "from" Embraer is what you meant, I guess. "First Wideroe stats: 2 E190-E2s each flying 8 cycles & 11 hours/day, 300 fleet flight hours, 100% schedule reliability. Maturity at EIS, as promised!" "Embraer hopeful for strong E2 sales at Farnborough"
"With the first two E190-E2s flying with Norwegian regional airline Wideroe, Embraer hopes it will bring strong sales momentum to the upcoming Farnborough Air Show. In the transition from the E1 to the E2, Embraer plans to deliver between 85 and 95 commercial jets this year based on continued strong demand for the 175. A mid- to high single-digit number of E2 will also be delivered this year, among them the first two aircraft for China’s Hainan Airlines and five for Kazakhstan-based Air Astana." "This paint scheme gives me goosebumps. Introducing the 2018 @embraer #E190E2 #ProfitHunter. Check it out at #FIA18. ✈️"
Who is on the shortlist for E2 orders? Wow! Just wow! That is full utilization out of the gate. That should help sales campaigns. Hmm... ARJ-21 4 flights per day, maybe 5.5 hours after years. With what, 5 aircraft?!? Services will begin on August 17, 2018, and will offer connections onwards to Oslo and Helsinki from Bergen." What in the world does a codeshare have to do with an aircraft order. Let alone a flight testing and production thread. Or is it now just a PR thread? MAX’d out on MAX threads. If you are starting a thread, and it’s about the MAX - stop. There’s already a thread that covers it. Don´t see any problem with some PR since flight testing and production are related to sell the plane itself. Not sure what the second part means, but ya, I can certainly just skip the thread. I do like hearing about the progress of the program but find some of the pr stuff overdone. I can just wait to catch up with the orders in an orders thread. Finnair with 8 A319's and and 12 E 190's, that'd be a great customer to land if Embraer can swing it (12 190E2, + 8 195 E2 options?? ) Here's hoping! Aeromexico has just taken delivery of its 61st Embraer. They're retiring all Embraer 170's and moving to an all Embraer 190 fleet. The first Embraer 190 got here back in 2007. I wonder when and how many orders will soon be placed for the E2. I think Aeromexico will be one of the first customers to fly the E2 in America. Ricardo Morales - flyAPM - ¡No es que maneje rapido, solo estoy volando lento! Kenya Airways deciding between the E2 and C series for a decision for up to 20 units by year end. The "Pioneer Airlines Flights" episodes. The 175E1 is the superior product in its category in the USA in my opinion. Given the non-scope compliance of the 175E2 as such, is there a possibility of a compromise that will fit scope? Would either the geared fan on the old wing or the “old” engines on the new wing be an option as a 175E1.5? The recent approval of the MRJ-70 development seems to be a nod to the notion scope not change in the USA. Embraer is already delivering a modified wing that reduces fuel burn but didn't add so much weight to reduce range at 86,000lb limit (more range for non-US applications). The new engines are just to heavy. I don't understand some other weight added. Some I do. The issue is zero CFM-34-8 fuel reduction PIPs.. many durability and reliability PIPs. But with a single stage turbine, the PIPs just aren't as effective .. just physics. There are reasons the V2500, PW1xxx, and LEAP have two stage high turbines. The CF34-8 has a two stage HPT. The -10 has a single stage HPT as it's core is essentially a scaled CFM56 core. So my going theory had been the reason no manufacture had put together a GTF new generation engine 76 seater that met scope is you just can't build one under the gross weight requirement, not that every manufacture decided to not do it out of mistake or whatever (although the bet that scope would be relaxed looks like a mistake). Is that correct that although there might be even more weight on the 175E2 than necessary, that there just is no way to get under 86k with new engines on any frame if you're stuffing in 76 seats? I absolutely understand where you are coming from, but IMO because the E190 is such a liquid asset, which such a wide variety of operators, the lessors really don't have too much to worry about. The wide base of E1 operators will make it much easier for lessors to place new E2 aircraft. I agree that the PR parroting here is getting a little annoying. There's some good information amongst it though. You're probably right regarding the 175E2's future in the US. Not all 175E1s were sold to US customers though; other customers might not be constrained by the scope clauses in the same way that the US regionals are, so might find the 175E2 appealing. For sure the bulk of 175E1 went to US operators though, so the 175E2 doesn't look to have a bright future at this point in time. Embraer E190-E2 - 6 weeks in operation. So far, so good? "From the introduction April 24th, until today the two aircraft LN-WEA and LN-WEB have done almost 250 revenue flights, with only minor delays and disruptions. No cancellations have been made, and even the above mentioned flight AY 942 was completed with only a delay of 3 hrs." "After going through my limited data set I found that combined LN-WEA and LN-WEB have racked up around 225 flight hours of revenue flights. For WEA this is an average of around 4,5 hrs a day, and for WEB the average is around 5,5 hrs a day. There are about 20 flight I do not have data for, so the average may be a bit higher. If I round upwards to 5, and 6 hrs respectively, even then there is a lot of improvement when it comes to better utilization of the aircraft. With the continued focus on training cabin crew and flight crew, and with the introduction of several new routes to European destinations and charter operations from Bergen to Turkey; I expect the average flight time per aircraft to increase much in the coming months." "From my perspective the introduction of the Embraer 190-E2 seems like a success. It seems that Widerøe have taken a conservative approach to utilizing the new aircraft. With an average of around 5-6 hrs of production every day spread across 2-3 round trips, the risks of delays and cancellations is minimized. Minor delays are easily caught up because of the generous timetable for these new aircraft. Widerøe is also working very closely with Embraer and Pratt & Whitney to ensure that everything runs smoothly." New Widerøe routes in green. Charter route on behalf of Tyrkiareiser in orange. The reality is that in this size segment, reliability and maintenance costs matter more than 1-3% of fuel burn relative to peers. If the E2 can meet or exceed Neo and MAX (gold standard) performance for overall reliability and maintenance costs (frame, systems, engines) then I fully expect additional orders. Maturity in this market range is massively important ... it seems EMB understood this and invested time/resources accordingly to achieve. Cheers to future campaign wins!